Sarakhs Zone is ready to accept and cooperate with foreign investors who are willing to take part in the Zone’s trade, economic and industrial activities. “Iran’s Sarakhs Free Trade Zone (FTZ) is open to foreign investment,” Head of Iran’s Trade Promotion Organization Valiollah Afkhamirad announced. “Sarakhs Zone is ready to accept and cooperate with foreign investors who are willing to take part in the Zone’s trade, economic and industrial activities,” Afkhamirad said on Thursday. He described the gas refinery and Sarakhs airport as advantages of the city and said double efforts should be made to identify the competitive potential in order to attract foreign investors to the area. Sarakhs special zone with an area of 5,290 hectares is located in northeast of Iran and connects ports in the Gulf of Oman and the Persian Gulf to Central Asia, the Caucasus and Russia. During the first half of the current year (March 21-September 22) 6,982 tons of different products including construction materials, tea, nuts and chocolate were produced in companies stationed in Sarakhs Special Economic Zone, showing an increase of 217% as compared to the same period last year. Sarakhs Special Economic Zone due to its geographical location which is in the heart of ECO member countries is the best golden gate for entry into Central Asia, China and Russia and a connection bridge to major trade markets of Central Asia for the Persian Gulf states in south of Iran, Europe in the west and Afghanistan and Pakistan on the eastern side. Sarakhs started its activity as a special zone simultaneously with the operation of Mashhad-Sarakhs-Tajan railway in the presence of leaders and representatives from more than 100 world countries in 1996. 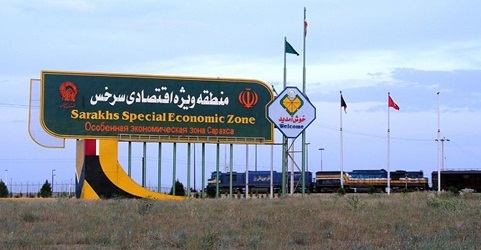 Sarakhs Special Economic Zone is situated 150 km east of Mashhad and 15 km from the city of Sarakhs and borders Turkmenistan in the north and east.